According to the 1962 Missal of St. John XXIII the Extraordinary Form of the Roman Rite, today is the feast of St. Evaristus, one of the first popes and the successor of St. Clement. Pope Evaristus governed the Church from 97 to about 107. He was buried at the Vatican. The episcopate of Evaristus began in the third year of Emperor Trajan's reign. Sources refer to him as a Greek from Antioch, the son of a Jew named Juda from Bethlehem. 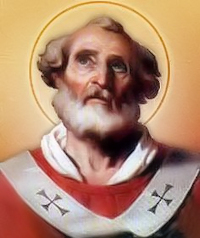 The exact length of his reign has been disputed by historians, as have been the authenticity of his letters and decretals; however, early scholars credit Evaristus with dividing Rome into specific parishes and with ordaining fifteen bishops, seven priests, and two deacons. Lack of historical evidence for these acts, though, would make them questionable. In his first epistle addressed to the bishops of Africa, Evaristus decreed that seven deacons were to monitor a bishop's preaching, to ensure that he did not lapse from the true teachings. Evaristus did not wish to see undue accusations aimed at his bishops, yet reserved solely to the See of Rome the power to terminate any bishop as a result of this indiscretion. His second epistle drew a comparison between the lasting bond of husband and wife and that of a bishop and his diocese. Fragments of certain documents bearing his name have been proved to be forgeries, and therefore the validity of his epistles is doubtful. Evaristus did, however, live long enough to see the beginning of the Antonine dynasty. According to Church tradition, he died a martyr and was buried near St. Peter on the Vatican Hill, but again, there is no reliable evidence to support this.